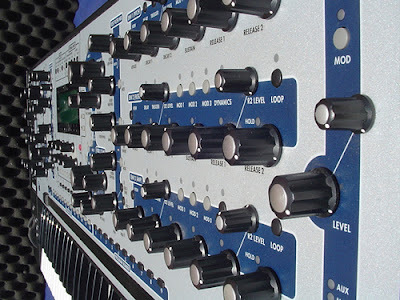 A great thread is up on the VSE Forums on the Alesis Andromeda. I know the threads expire there, so I'll grab some of the most interesting bits here. DB below is David Bryce who worked on the Andromeda. I remember when all of this was happening. Mike Peake was on sonic states the-gas-station and AH. The guys behind the Andromeda really loved synths and they respected the rest of us enough to frequently pulled us in for feedback on the design of the synth. It was as if they were one of us, and in reality they were and still are. Mike Peake stayed active in the synth community and as you can see from this thread, David Bryce is still very active. You have to love a company that does this. Great people make a great company. I personally think Alesis has been one of the better synth manufactures to date. The Andromeda, ION and Micron, and the Fusion have all been pretty amazing synths. The price points for what you get compared to what else is out there is astounding when you think about it. Do take the time to check them out. The Andromeda is a 16 voice analog with a huge modulation matrix, dual filters, built in step sequencer and much, much more. And it sounds pretty amazing imo. Whenever I think I've heard it all, someone makes a demo that showcases a completely new character of the synth. BTW, are there any other poly analogs with 16 or more voices other than of course the fully polyphonic boards using divide down technology? Making Andromeda was really the culmination of a dream for a bunch of us who had grown up with the older analog synths. We had spent years working on sample based stuff, and Erik and Rob Rampley got Alesis founder (and major engineer geek) Keith Barr drunk one night and talked him into letting us make an old school American power synth. Keith actually designed Andromeda's ASICs himself, if memory serves. It wasn't the marketing group. I was the marketing manager of the synth division, and I was certainly behind it. It was the VP. seems like they would want to distinguish Alesis from the "workstation hell" of that era. Not just workstations - it was VA synths, too. We figured making a Real Actual Analog synth would catch some people's attention (as Bitexion correctly surmised). does the Andromeda have Polyphonic Aftertouch? Dave, the one major question I have had and the one thing which has kept me from pulling the trigger on an A6 purchase is what will the status of the A6's ASICs be in the future? CEMs and SSMs were used in several synths from many manufacturers so those chips were manufactured to some degree in surplus as we see today (although they ain't cheap Crying or Very sad). Did Alesis make sure that the IC manufacturer made enough chips to fulfill any future failures or is the well not so deep? Is the A6 still in production and will it remain so for the foreseeable future? Will the support continue for the machine i.e. OS updates/fixes? Are the first, more expensive Alesis A6’s different in any way than the later Numark ones that are apparently now made in the far east as some claim the earlier Alesis ones sound better? There are rumours that some of the people behind the A6 were also involved in the Xpander/Matrix12 is this true? Will there ever be an analogue successor or derivative or the A6 as the VA market has kinda reached a standstill now? I can only answer two of those questions becuase I haven't worked for Alesis for about seven years, so I have no idea what their current plans are. Marcus Ryle, who founded Line 6, was one of the guys responsible for the XpanderMatrix 12. He and his team had a lot to do with a bunch of Alesis products including the ADAT and the QS synths...but they had nothing to do with Andromeda. There are a few "rev 2" Andromedas that were only used during beta. They are slightly different from the production models, but the OS in them is different enough that you can't transfer programs between, them, so they can't really be directly compared....nor, if you could, is there actually any point in doing so. Howver, all the production models are (AFAIK) exactly the same...."
And that's it as of the time of this post. Check out the VSE thread for updates. I'll try to update this post with the historical bits so we don't lose them. Image via this post. What ever happened to Peake? Has he ever returned to planet earth or is he still "out there" lost in space. He's knitting organic socks from flaxen cuban castoffs. Peake did some work for Buchla a few years back. I googled him recently. I found some tracks on Soundclick but that's about it. He must stay off the web, or stay anonymous. I really hope Alesis do something more for the A6... They have a winner synth in their hands but who knows why they keep it hidden to the "audio" masses. No advertisement, nothing. They're doing the Moog thing much cheaper and profitiable with the Micron. The official line from NUMARK the owners of Alesis is that they are NOT going to do anything new for the A6. They seem to think that every bug has an acceptable workaround according to Dan Gill in tech support. They currently sell between 5 and 10 units of the A6 per month. As long as that figure doesn't go lower they say they will keep it in production. And how many of those 5 to 10 new A6s come back because of defective voices? I've never used anonymous accounts.